Photo postcard by George Hall, circa 1915, courtesy of Lens & Pen Press. Since today is Halloween, I thought it might be fun to devote a blog to an honest-to-goodness James River ghost story! Have you ever heard about the ghost of Virgin Bluff? And more importantly, how does this ghost story relate to JRBP’s mission to protect the James and other Ozarks streams? Virgin Bluff is located three miles south of Cape Fair, where the James enters Table Rock Lake. It takes its name from a local legend about a Native American woman who reportedly fell in love with a Spanish soldier who was part of a party of explorers, possibly under Hernando de Soto. The love affair was soon thwarted by the girl’s father, who was chief of her tribe. Learning of the chief’s plot against him, the Spaniard fled the area, never to return, and in her grief, young girl (in many versions named Moon Song) threw herself from the cliff that was later named for her. The Chief reportedly placed a curse on the bluff, and early settlers of Stone County said that her cries and sobs could be heard near the spot. 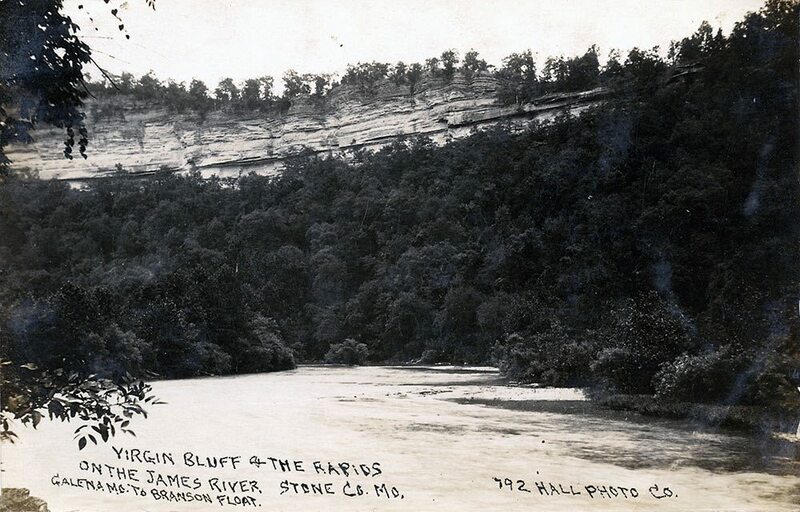 The rapids below the bluff reportedly claimed a number of lives throughout the 1800s, which seemed to confirm the old chief’s warning that the bluff was haunted. The curse even stopped a dam on the James, if you believe in such things. Around 1908, a colorful character named “General” William Henry Standish, a Civil War veteran from New York, moved to Aurora and began to propose the idea of a dam on the James to produce hydroelectric power. Passed by Congress, Standish’s proposal soon found itself on the desk of none other than President Theodore Roosevelt, who promptly vetoed the legislation because of its monopolistic control of the waters of the James. “Given the president’s reputation as an outdoorsman, one might conjecture that he had fished the James and wished to preserve it as premier smallmouth stream,” notes Leland and Crystal Peyton’s James Fork of the White, “But there is no indication that he ever floated any Ozarks river.” Given my love of all things Teddy Roosevelt, I share the Peyton’s disappointment that he never was “dee-lighted” about a float from Galena to Branson, but at least we have a bona fide T.R. connection to the James! The original plans called for a power plant at the base of the tunnel dam, which a 1912 article speculated could provide power to nearby settlements along the James and White Rivers, and that a “half-a-dozen” power sites along them might produce a “a hundred thousand horsepower sufficient to manufacture all the cotton raised in Arkansas and Oklahoma”! Standish soon recruited the Amberson Hydraulic Company to assist with construction, but by the summer of 1913, news of the dam’s progress dried up in area newspapers, save a reference in a Ste. Genevieve newspaper that the work had been “temporarily abandoned” while waiting to see if legislation would pass to allow the building of a large dam near Hollister. The beginning of the First World War a year later shifted the country’s focus (and funds) to war preparedness and essentially ended Standish’s dream of damming the James. Yet other accounts, such as a 1958 Springfield News-Leader article, hint that the project was plague with a series of accidents, including “rock slides, bizarre equipment failures and…deaths and serious injuries to the workers.” Some workers started to wonder if the old chief’s curse wasn’t just a legend, and refused to work on site. Even today, some folks believe that the curse still prevents folks from taking a clear photo of the bluffs, and some still report hearing the virgin’s sobs and cries while sitting around a camp fire on one of the James’ gravel bars on a crisp Autumn Ozarks evening. Next week, the rest of the story…until then, Happy Halloween! JRBP would like to thank Leland and Crystal Peyton of Lens & Pen Press for their assistance with this article! Virgin Bluff today. Photo courtesy of Lens & Pen Press. Newer Post"Where the Magic Happens"